Nynas Nypave PX 35 is a paving grade bitumen produced from selected bitumen feedstock, rheologically modified to deliver a range of enhanced performance options. It is produced according to EN 12591. Nypave PX 35 is available from the Nynas Extra category of products. The aim of the contract was to protect with a thin layer the structure of the road and to improve the existing surface, both in terms of grip and of repairing minor damage to the surface. The project was also used to demonstrate the capability of thin surfacing layer to reduce noise by 4dB(A) or more. Applying thin surface layers in winter requires special measures to be taken. Using a hot mix, there can be a problem with compaction and adhesion to the existing substrate. The window for compaction at low ambient temperatures is narrow. The rapid cooling rate of the asphalt mix in such hin products represents a real challenge. A split mastic asphalt guarantees the resistance to deformation required and the fine macro texture of an SMA 5N also considerably reduces road noise by approximately 4dB(A) or even more. A Nypave PX 35 bitumen was used for this application in mid December and this resulted in a thin overlay with good qualities of compaction and a substantially reduced noise emission level. This project was completed with excellent results on a stretch of road near Waldbröl-Bruchausen in December 2007. The 25mm layer was applied at an air temperatures of 5oC- 7ºC. The mix temperature was approximately 185ºC in the plant and 160ºC behind the screed of the finisher. Under these conditions – described as 'low ambient temperature' – the mix was produced at normal temperatures and the improved workability was used to reduce the risk of failure during the execution of the job. Under normal ambient circumstances, the temperature of mixing and laying can be lowered significantly in order to reduce CO2 emissions. A polymer modified bitumen emulsion was used as a bond coat in order to optimise the bonding of the thin layer. 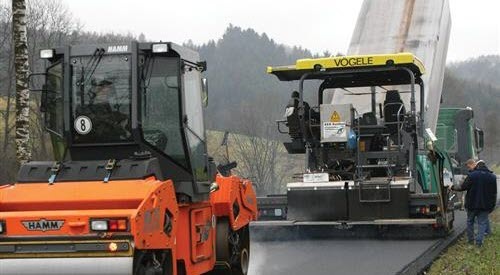 Download this information on how Nypave PX 35 was used at Dahl - Bruchhausen, Germany, as pdf.